Columbia Double Discovery Center students outside Hamilton Hall. 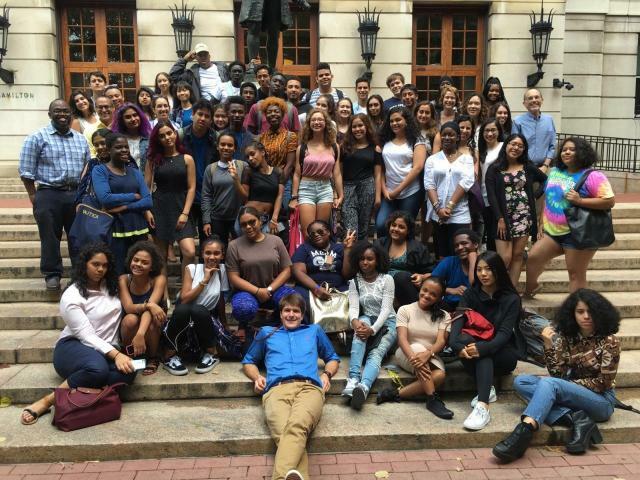 The School of Professional Studies (SPS) Community Relations department is collaborating with the Columbia Double Discovery Center (DDC) to offer a nine-week survey course, “Career Discovery Lab: Turning Interests and Passions into Careers,” for 10th, 11th, and 12th graders from DDC’s partner public schools in fall 2018. Presentations exploring careers and sectors represented among SPS graduate programs are offered on the Columbia Morningside campus. Through lectures, discussion and learning activities, DDC students begin to understand how their interests may align with different careers as well as the pathways into diverse professions. “Through this collaboration, SPS faculty, staff, and alumni reveal new fields and careers that Double Discovery students can consider and aspire to as they proceed from high school to college and beyond,” says George Calderaro, SPS Director of Community Relations. Established in 1965, the Double Discovery Center (https://ddc.college.columbia.edu/) (DDC) aims to increase the high school graduation as well as college enrollment and completion rates for low-income, first generation college-bound youth from public schools in Harlem and Washington Heights. It provides students with high-quality activities across three key areas: Academic Enrichment, College & Career Success, and Healthy Minds & Bodies. The “Career Discovery Lab” supports the DDC Career Explorations & Development component of its College & Career Success focus.